Wayne Homes announces awards received at Building Industry Association of Central Ohio Marketing and Merchandising Excellence awards gala. Team members from the Delaware and Newark model centers attended the banquet on Friday, May 11 in Columbus, Ohio. It was an exciting evening and there was a great sense of pride among the team. Wayne Homes, an Ohio-based custom homebuilder, received several awards from the Building Industry Association (BIA) of Central Ohio Marketing and Merchandising Excellence (MAME) Awards. The winners of the BIA of Central Ohio 2018 MAME Awards were announced at a banquet on Friday, May 11 in Columbus, Ohio. Team members from the Delaware and Newark model centers attended the event. Julie Hurtt, a New Home Consultant from the Delaware Model Center, was recognized during the awards banquet and won the Rookie of the Year award. 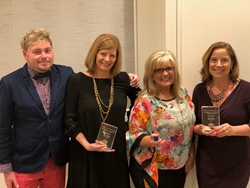 New Home Consultants Julie Baumker and Angie McKinney from the Delaware Model Center and New Home Consultants Sue Crow, Sandee Barrick, and Tonya Harding from the Newark Model Center were also acknowledged with Sales Citation awards. Wayne Homes also received marketing awards for the Best Print Ad, Best Social Media/Blog Experience, and Exceptional Digital Media Campaign. “It was an exciting evening and there was a great sense of pride among the team,” Erin Collins, Vice President of Sales, said. The MAME Awards honor the top achievers in the new home industry. Sales and marketing award winners cross all BIA membership ranks and include realtors, interior designers, architects, landscapers, suppliers, remodelers, builders and more. For more information about Wayne Homes and the Columbus area model centers, please visit WayneHomes.com. Wayne Homes is a custom home builder in Ohio, Pennsylvania, Indiana, Michigan, and West Virginia (see all Model Home Centers). We offer nearly 50 fully customizable floorplans and a team dedicated to providing the best experience in the home building industry. For more information, Ask Julie, our online sales team, by Live Chat or call us at (866) 253-6807.